Los Angeles City Attorney Mike Feuer, at podium, speaks at a news conference in Los Angeles, Jan. 4, 2019. Feuer said that owners of The Weather Channel app used it to track people's every step and profit off that information. 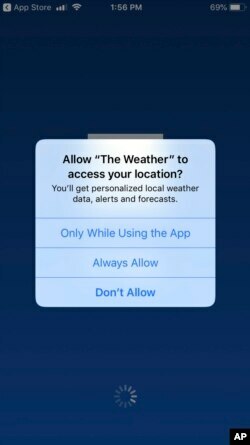 A mobile phone with The Weather Channel app location preference page is seen Jan. 4, 2019.